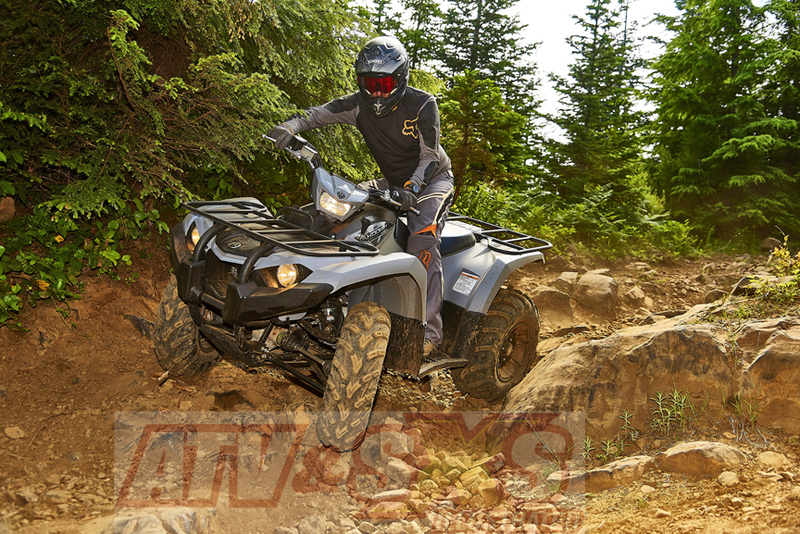 Yamaha reentered the mid-sized market with the new Kodiak 450 ATV. It is a welcome addition to the lineup and we couldn’t wait to test it on the beautiful trails of Washington. Yamaha had a problem, not with one ATV in particular, but instead with a lack of choices. For the last couple years every ATV in the Yamaha utility lineup featured the same 708cc engine. 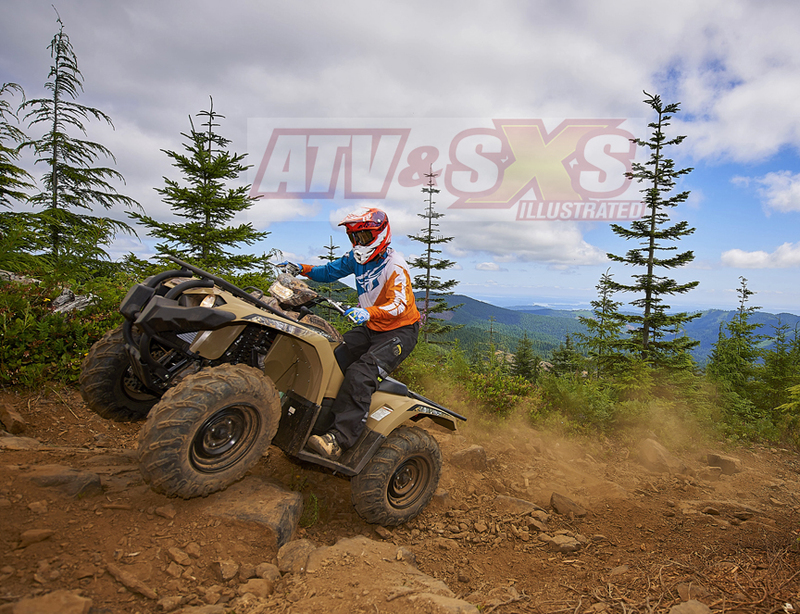 That left a lot of midsize utility ATV buyers wanting, and eventually buying elsewhere as manufacturers like Polaris, Honda, Can-Am and Arctic Cat filled out their lineups with plenty of midsize ATVs. And midsize models are the preferred size for many buyers who can easily feel a little intimidated by big-bore power. Yamaha's answer is the all-new Kodiak 450. Easy to maintain thanks to tool-free air filter removal, and easy access dip stick. Thanks to ample, usable power and good stock suspension the Kodiak 450 is supremely capable of taking on difficult terrain. It’s comfortable and fun to ride. Visually the Kodiak 450 looks great and the styling leaves no doubt it is a part of the Yamaha family. We’re especially fond of the color choices from the deep, Hunter green, a very sharp Armor Grey, or a military-esque Fall Beige with Realtree Camo highlights. All versions of the Kodiak share the same bodywork and Yamaha was especially careful to sculpt it so that the rider would still have plenty of room over the compact chassis. Even the shift lever was moved forward to open up extra knee room, and a longer seat was used to create extra comfort. Handlebar controls have been redesigned, including a new thumb throttle that relieves pressure on your thumb thanks to a curved blade design. 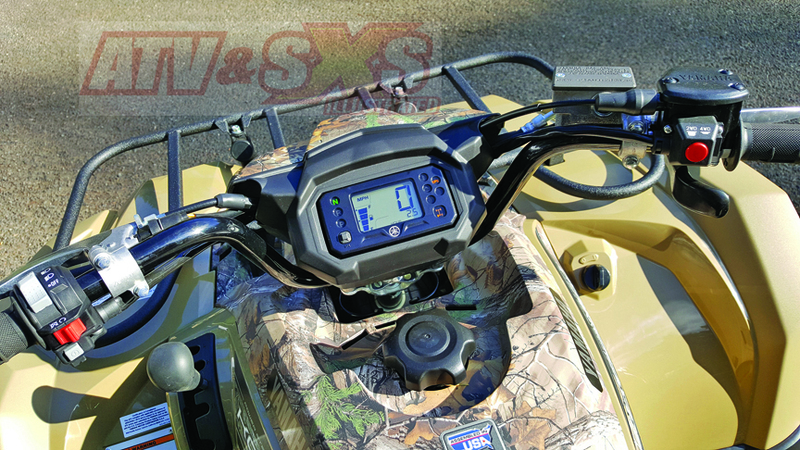 A 2wd/4wd button on the throttle housing is easy to find as well, and in the center of the bars is a new, easy to read digital display that shows everything you need. 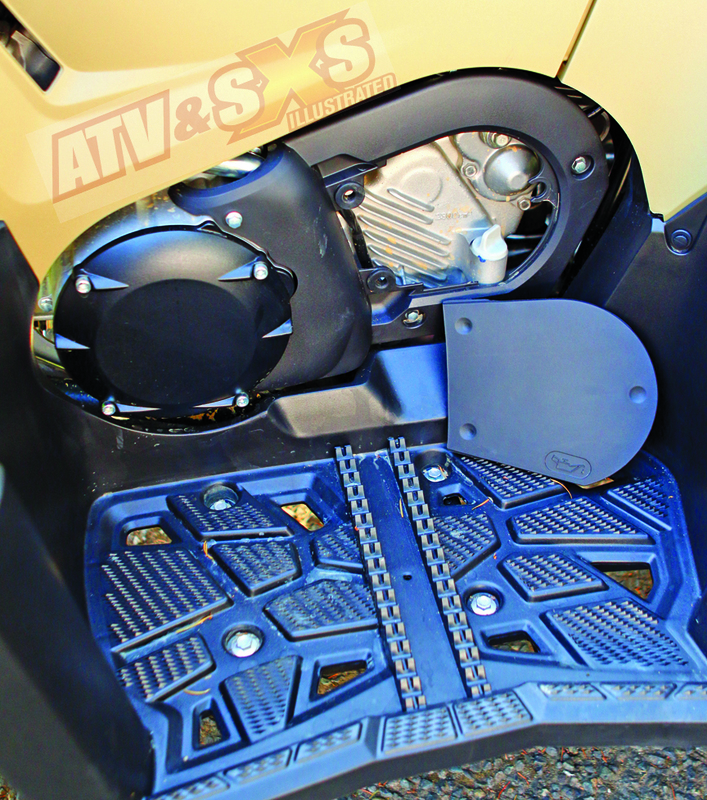 Down below are full floor boards, but Yamaha boosted the peg area up slightly over the Grizzly models, making it better at keeping your hunting boots planted when loaded up with mud or snow. 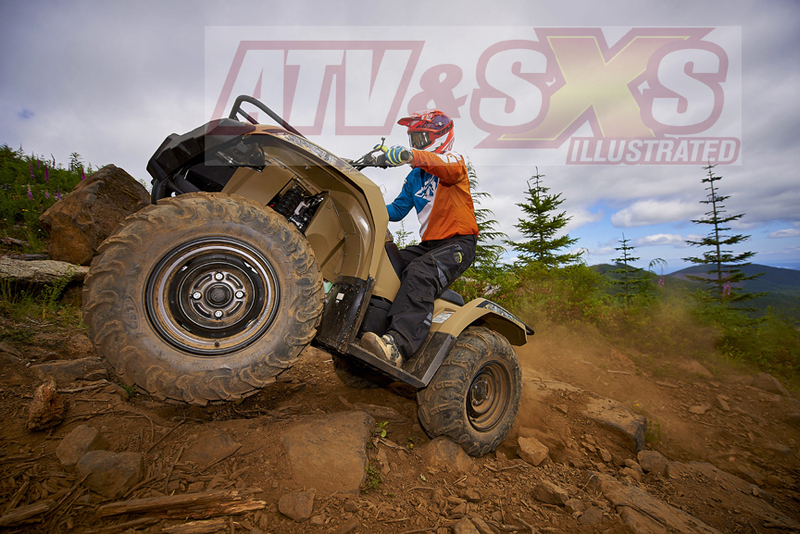 With the features Yamaha included on the new Kodiak 450 and 450 EPS it certainly promised great potential on the trail. We changed into our gear and prepared for a day of riding Washington’s Capital State Forest. This area offers major elevation changes, mud, rocks, and lots of trees hugging the trail. There is challenging terrain here for all, and thanks to the towering spruce and cedars it’s often quite dark even at midday. We generally like the feel of a smaller chassis for their greater maneuverability, but they can sometimes feel a little cramped. Not the Kodiak 450. From the seat, the bars reach out to you nicely without jamming your elbows into your ribs, the seat foam is comfy, and everything feels well placed! It’s comfortable and feels very natural. A stab at the start button on the left handlebar got the 4-stroke engine spinning, and the sound was quiet enough to talk over. We easily slipped the lever into High and headed for the trails. The control layout on the Kodiak 450 is clean, well organized, and easy to understand. Everything is within reach and it makes a very intuitive riding experience. The new thumb throttle and digital display are excellent. We have to give Yamaha credit for designing a new chassis for the Kodiak 450 and 450 EPS. While some manufacturers just grab a full-size chassis and stuff a smaller motor inside, Yamahas enormous commitment of design time and expense have made it all worthwhile. This chassis works! It’s compact, nimble, well designed and built, and amazingly stable. On the trails, the slightly shorter wheelbase allows you to carve through tight corners, yet the ample width keep the Kodiak 450 sure footed and stable on off-camber and rutted sections. Dual A-arms at the front and Independent Rear Suspension aren’t a feature on every intermediate machine, but there is no doubt they offer a better ride. 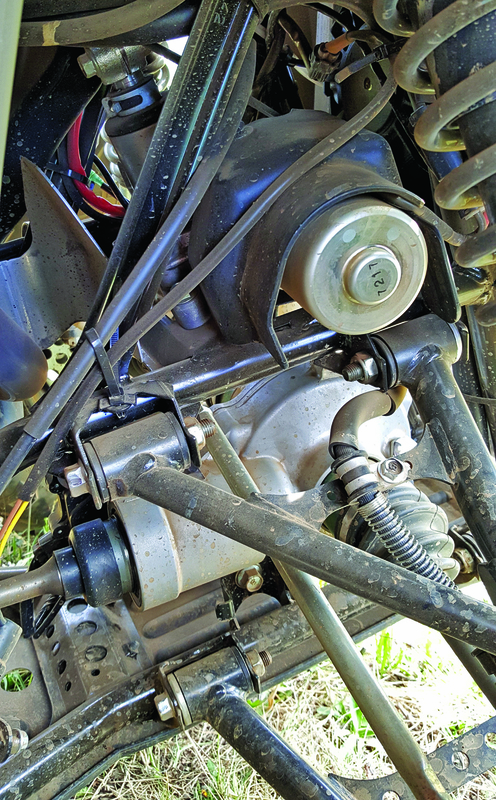 The stock settings and shocks on the Kodiak 450 are adequate for most riding, but with a few simple adjustments we made them better. Cruising down the trail, the 421cc, fuel injected motor purrs along quietly. A blip of the throttle gets immediate reaction from the Ultramatic CVT transmission, and there is no noticeable lag when back shifting. Shifting between any of the gears is easy thanks to the left-hand shift lever, but you will need to hold a brake. Thankfully, Yamaha gave the Kodiak both a front and rear brake lever on the bars, and a rear foot lever. Top speed seems to be just over 50 mph and even then it still feels incredibly stable. The only time the engine ever protests is under high torque situations such as when climbing big, steep hills. You’ll hear a little extra clatter then, most likely from engine top end noise. 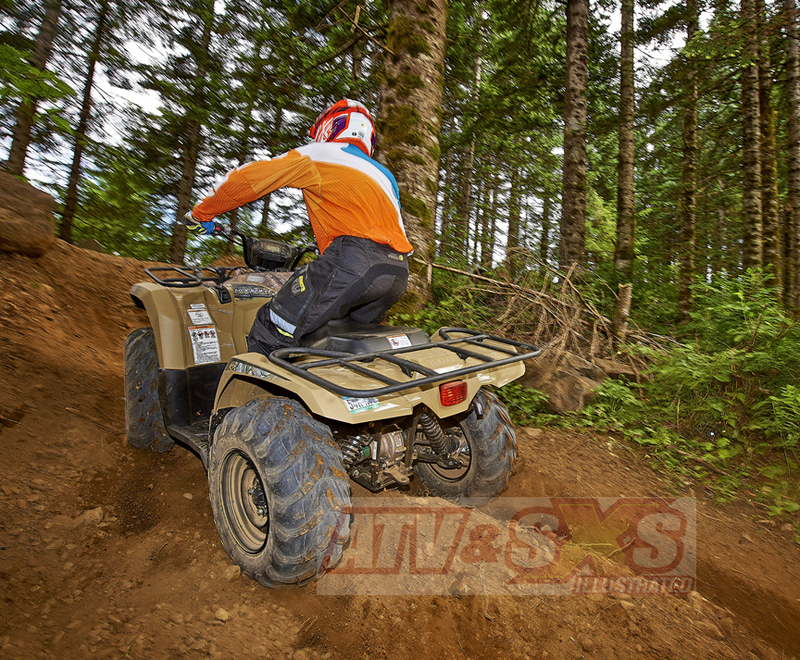 Thanks to generous ground clearance the Kodiak 450 clears most trail ruts with no hangups. Independent rear suspension makes a big difference. We spent much of the day climbing every huge hill we could find, darting between trees, and picking our way up and down trails strewn with rocks of every size. Overall, we have to give the 25” CST tires high marks for durability, traction, and ride. Even though they have a rounded profile, they don’t feel bouncy like some similar profile tires. This is due to their 4-ply carcass which also helps it resist cuts and punctures. After an entire day of testing with many different machines and riders we hadn’t encountered a single cut tire. Considering the rocky sections we covered this was a minor miracle! By shifting the transmission into Low we were able to creep through and climb over rocks or loose terrain easily. The CVT is tuned for high torque situations like this, and it does a good job of keeping you in the heart of the engine power. As with the big hills and rocks, muddy sections were conquered by slipping the Kodiak into 4wd. There is no differential lock, but we never missed it. Another feature we were happy to have in these areas was separate brakes. It is an enormous control advantage to independently control the brakes, and the Kodiak brakes work very well, especially after we gave them a slight adjustment. A sealed, oil bath system at the rear virtually eliminates any maintenance, and since it is completely sealed you’ll almost certainly never have to work on it. 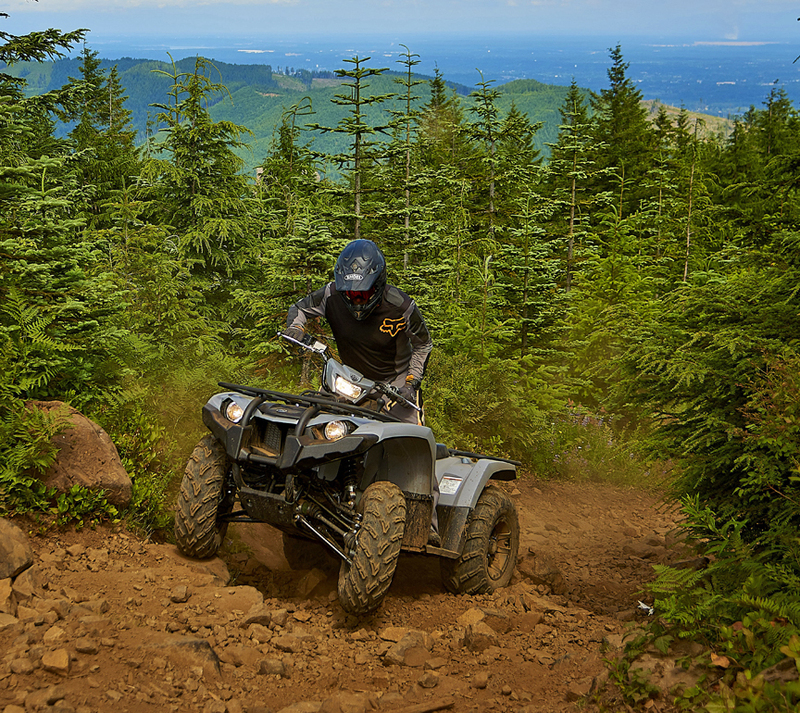 The ever-so-slightly smaller size of the Kodiak 450 makes for a sporty ride. However, careful design means we were never cramped for space. 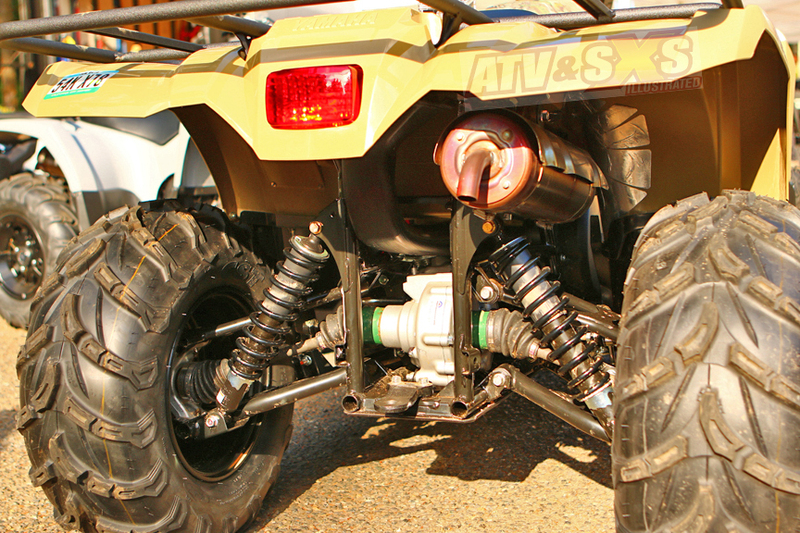 The major difference between the versions of the Kodiak 450 is Electronic Power Steering. On the model without EPS we never missed it, but once we spent some time on the EPS equipped Kodiak we would opt for it in almost every situation. Unless your budget is extremely tight, get the Kodiak 450 EPS. Yamaha has their power steering system so perfectly dialed in it feels natural. We also love how it takes any kickback out of the handlebars. The standard Kodiak 450 steers good. The Kodiak EPS is far better. You can almost always improve a machines performance and get it working better for your riding style and terrain by making a few simple adjustments. On the Kodiak 450 there were two areas we worked on. The stock front shocks would sometimes bottom over extended ruts and whoops. That is partially the result of an aggressive riding style, but by stiffening them one notch the ride was noticeably improved. This would be a good option for most Kodiak 450 owners. The second area we made a change was to the rear brakes. Oil bath brakes are all but bullet proof, but they can sometimes feel a little spongy. For better reaction and feel we tightened the adjustment nut and this made an immediate improvement to performance and feel. Control is extremely important in areas like this. Thankfully, Yamaha still believes in dual hand brakes, and a foot brake. Precise maneuverability is a welcome trait of the Kodiak 450 also. Our only other change on the Kodiak 450 was to the levers and thumb throttle which we prefer to angle slightly down towards the front end. This aligns much better with your hands when riding. Yamaha really did a great job with the fit and finish on the Kodiak 450 and 450 EPS. After a close inspection of the new Kodiak chassis we were highly impressed. Everything fits very well, with tight seams on bodywork. Welds are very clean, and it has all the hallmarks of a well-designed and built machine. We’re always concerned about the ease of routine maintenance tasks, and Yamaha made those easy with the Kodiak 450. 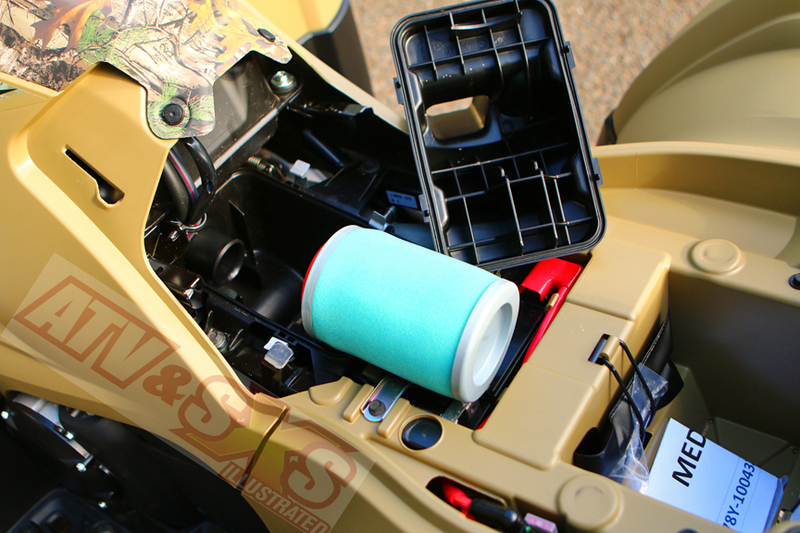 The foam air filter is right under the seat (along with the battery) and can be removed with no tools! On the left side of the engine is a handy dip stick behind a panel that pops out of the way for quick oil checks, and changing the oil should be no problem. Thanks to Yamaha for putting the dipstick behind this easy to remove panel. It makes oil checks before each ride easy. One great feature Yamaha built into the new Kodiak 450 is the ease of integrating accessories. If you’ve ever installed a winch you know it’s not always easy to route wires, make wire connections, and install mounting plates. Thankfully the Kodiak chassis is prewired and the winch mount points are already welded into the frame. A sturdy hitch at the rear makes towing easy, and Yamaha was sure to add mounts for gun boots, rack extensions, cooler racks, and about anything else you could want to carry or tow for your adventure. The only thing we wished for the on Kodiak 450 and Kodiak 450 EPS is a little more storage. There is a storage container under the seat but it would be nice to have a second, sealed storage area on the fenders for your phone, wallet, etc. Some things just require extra protection. Yamaha was the first to introduce Electronic Power Steering and it gets better with each model. 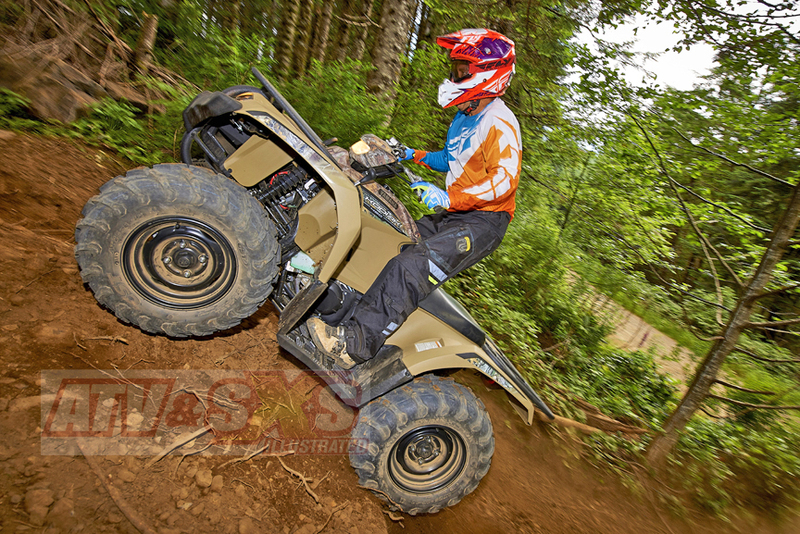 It helps with arm fatigue and reduces unwanted kickback without taking away trail feel on the Kodiak 450. It’s perfect. Another outstanding feature is the easy access filter that can be removed with no tools. A small storage box is just behind, although a secondary, sealed storage area would be welcome. There is a lot to love about the new Kodiak 450 and Kodiak 450EPS. They are capable, comfortable, and fun, which is just what most buyers look for. The engine has enough power for work or trail adventures and the chassis responds precisely and feels very stable. With a few easy to install accessories you can really customize it to your needs. 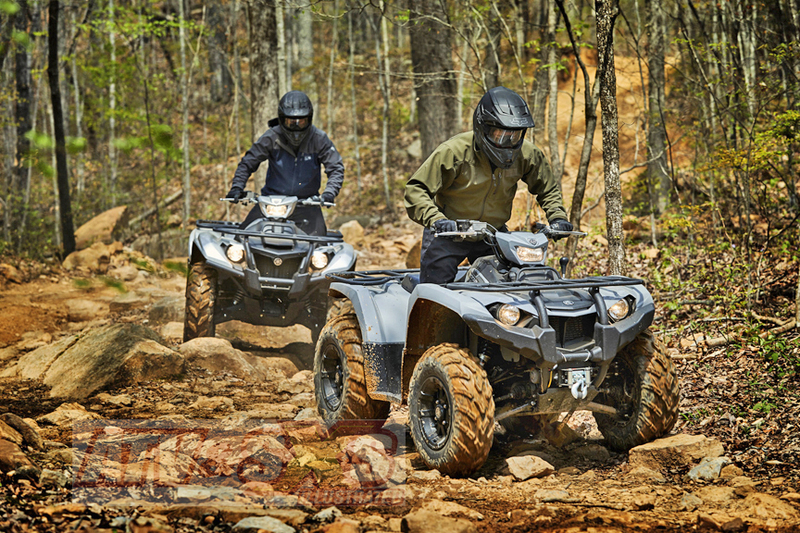 Finally, it’s great for the needs of some families too, since the new Kodiak, like every Yamaha Side-by-Side and full-size ATV, is proudly assembled in the USA. You can’t go wrong with the new Kodiak! Great trails, a great machine, and great friends. Does riding get any better than this?